Dimensions (HxWxD): 0.813" x 0.5" x 0.25"
These beautiful Larimar Lovely Earrings were designed and fabricated in the Dominican Republic, the island nation where this sea-blue gemstone was discovered. These Larimar earrings are .813 inches long and weigh .21 oz. 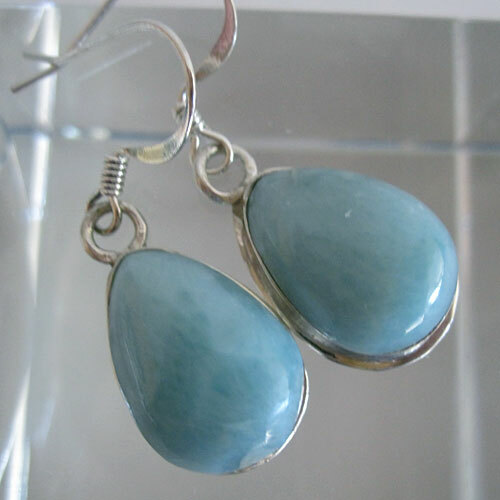 These powerful Larimar earrings works to open and equilibrate the upper chakras, and empowers the bearer, helping the individual get in touch with their own inner truth, and enhancing the ability to communicate that inner truth to others, on an individual basis, and through the mass media. In 1974, the world gemstone market was introduced to a blue form of pectolite, a gemstone variety of this hard, white mineral with a vitreous luster, found in hydrothermal pockets, and associated with metamorphic rock formations. Blue pectolite is of volcanic origin and is found only in a mountainous, relatively inaccessible region of the Dominican Republic overlooking the Caribbean Sea. “The most important outcrop of blue pectolite is located . . .about 10 kilometers southwest of the city of Barahona, in the south-western region of the Dominican Republic,” according sources at the Larimar Museum. These two rockhounds gave the stone the name “Larimar”, which came from Méndez’ daughter’s name, “Larissa” and the Spanish word “Mar” for sea. Because of its blue color, which is associated with the fifth, or throat chakra in Western Mystery School traditions, Larimar is widely believed to equilibrate and harmonize the energies of the throat chakra. The throat chakra governs the mouth, the throat and the thyroid gland and stimulates the thymus region. A balanced third chakra stimulates creative communication, and facilitates all forms of work in the mass media. An imbalanced throat chakra often indicates that the individual has important life issues that have been repressed because of fear, feelings of impotence, and suppressed rage. So wearing a Larimar pendant on or near the thymus is thought to help the individual resolve issues relating to failed communication, to open up to others, and to realize their full creative potential. Jane and I love Larimar. Our experience with Larimar is that this gemstone is a Blessing from the Goddess, conferring comfort, nurturing energy, and providing a kind of energetic emotional rescue. Larimar has a relaxing energy signature, soothing body, mind and soul while clearing the mind and providing the kind of safe, secure, grounding energy that we all need in these difficult times. Since the 1980s, Larimar has been known among metaphysical rockhounds as the Stone of Atlantis, thanks to Edgar Cayce’s predictions. Larimar is thought to be a healing stone that is quite a powerful cleansing agent, assisting the bearer in repelling unwanted entities and energies in one's environment and in one's physical body. Larimar is known as the Healing Stone of Atlantis because of predictions said to have been made by Edgar Cayce. According to many websites, American clairvoyant Edgar Cayce believed that part of Atlantis could be found in the Caribbean. These websites also predicted that in the future a powerful “blue stone” first used in Atlantis would surface on "an island in the Caribbean" and would be of tremendous value in healing. We contacted Edgar Cayce's Association for Research and Enlightenment and spoke to their librarian, Claire Gardener to find out more about what the famous psychic had said about this healing stone. According to Ms. Gardener, "Edgar Cayce never spoke of Larimar. The reason for the confusion is that he spoke of a blue stone." Apparently in response to a question about the location of a mysterious alchemical stone known as the "lapis lingua", Cayce responded that it ". . .is a large blue stone. It was removed from the mines of Arizona. It is the 'lapis', not 'lapis lingua', but another form of the 'lapis'." Ms. Gardener says that A.R.E. is confident that Cayce saw no relationship between the "lapis" and Larimar or Atlantis. Of course, Larimar had not yet been discovered during Cayce's lifetime. Asked if it was true that Cayce predicted that part of Atlantis would be rediscovered in the Caribbean and that on one of these islands someone would discover a blue stone with extraordinary healing powers, we were told that more research would be required to scour the vast Cayce archives in search of an answer. We never heard back from the A.R.E. on this matter, so it is up to each individual seeker to determine the truth of such claims for himself or herself. Crystal healers say that Larimar facilitates deep insight into one's own true nature as a spiritual being incarnated in a material world, and helps the bearer to release attachments to sensory stimuli and to release materialistic thought-forms and mental maps of the world. Larimar also stimulates the upper chakras and prompts the bearer to view existence from a more spiritual perspective, providing a taste of the way that angels see reality. See our article "Clear Quartz Crystals" & "Using Quartz Crystals in Digital Technology, Healing and Meditation" for an overview of the metaphysical and mineralogical properties of quartz crystal. You'll find a guide explaining how to clean, charge and program your quartz crystals for use in healing and meditation, and you can also read about Marcel Vogel's methods of crystal healing. Note: weight above is shipping weight. Net weight .21 oz. or 6 grams.